The Sorrows of Young Werther brings to life an idyllic German village where a youth on vacation meets and falls for lovely Charlotte. The tragedy unfolds in the letters Werther writes to his friend about Charlotte’s charms, even after he realizes his love will remain unrequited. “Reflections on Werther” and “Goethe in Sesenheim,” collections of excerpts from the author’s own memoirs, reveal the genius who, as Nietzsche said, “disciplined himself into wholeness.” Next is “The New Melusina,”the delightful story of a pixie princess who assumes the form of a woman as she searches for a human mate. Finally, “The Fairy Tale” is a sophisticated but strange story in which the laws of nature and physics do not apply—mingled among its human characters is a cast of two sentient will-o’-the-wisps, a giant and his shadow, a talking green serpent, and four metal statues. In 1771, Johann Wolfgang von Goethe (1749­–1832) went to Strasbourg to study law. There, he had a love affair that later inspired the idyllic Dichtung und Wahrheit (1814). 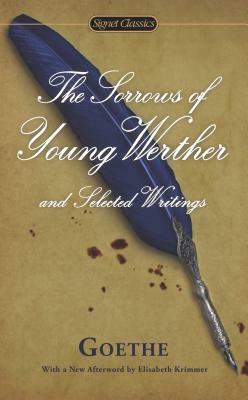 He then practiced law in Frankfurt, where he composed The Sorrows of Young Werther (1774). Goethe accepted an invitation from the Duke of Weimar in 1775 to join his court and for a decade held various official positions there. He spent 1787 in Italy, where he wrote Iphigenie auf Tauris and worked on the first part of Faust (1808). In 1791, Goethe was appointed director of the ducal theater, a position he held for twenty-two years. In 1806, Goethe married Christiane Vulpius, the mother of his four children. In the last year of his life, Goethe completed the second part of his masterpiece, Faust. Marcelle Clements is a novelist and journalist who has contributed articles on culture, the arts, and politics to many national publications. She is the author of two books of notification, The Dog Is Us and The Improvised Woman, and the novels Rock Me and Midsummer.